News from the DNC (Democratic National Committee) and ASDC (Association of State Democratic Chairs), among others, will be shared here. After many months of preparation and intense development efforts, the DNC is rolling out a brand new, state-of-the-art Data Warehouse. This is one of the biggest efforts to date fulfilling Chairman Tom Perez's commitment to overhaul the party’s tech and data infrastructure. The Data Warehouse is the centerpiece of our tech efforts and will allow campaigns and committees at all levels of Democratic politics to better store, access, and analyze their data. It will also help us to continue to innovate, expand and improve our data capabilities in 2019, 2020, and beyond. The new Data Warehouse replaces Vertica, which was established as a temporary solution in 2011, and will make it dramatically easier to run smart, data-driven campaigns no matter what office a Democrat is seeking. This is a game changer. Please tweet and help us share the good news! Since 2011, Vertica has been the Democratic Party's central repository for data—a place to store every state's voter file, every door knock and phone call organizers make, and every bit of commercially available data campaigns collect. It played an important role in President Obama's successful bid for reelection in 2012, and established having a strong data operation as core to modern-day campaigning. After just a few years, however, the system was already showing its age, and many Democrats feared that the lack of a strong data operation could handicap their candidates in 2020 and beyond. Krikorian started hearing what he calls “war stories” about Vertica almost immediately, as he interviewed former campaign staffers like Robby Mook, Clinton’s campaign manager, and Stephanie Hannon, a former Googler and Clinton’s chief technology officer. The system was famous for crashing for 16 hours at a time. One data director in North Carolina told him she used to nap in her car just waiting for Vertica to come back online. Mook, Krikorian recalls, likened Vertica to Beirut—when the system got overloaded, as it almost always did, it would just shut down until the shelling stopped. So, in the months before the 2018 midterms, a make-or-break election for Democrats, he made the risky bet to divide his 40-person tech staff into two teams. One team would need to keep Vertica alive through Election Day; the other would be in charge of building whatever came next. Now, Krikorian’s team is preparing to pull the plug on Vertica and stand up a new, more powerful system called, simply, the Data Warehouse. It will be backed by Google’s analytics tool called BigQuery, a cloud-based platform capable of handling massive datasets at the scale and speed necessary for an organization the size of the Democratic party. Below please find the announcement of the second DNC presidential debate location. Today, the DNC is proud to announce that the second presidential primary debate, broadcast live on CNN, will be held in Detroit, Michigan. The debate will take place in prime time on back-to-back nights on July 30 and 31. The debate will be broadcast live on CNN, CNN International, and CNN en Español. Our broadcast partners are fully committed to providing accessible communications for deaf and disabled audiences as well. An unauthenticated live stream of the debate will also be available for all users on CNN’s website, mobile apps and connected TVs via CNNgo. Today, the DNC is pleased to announce that Milwaukee will be the host of the next Democratic National Convention! Democrats from across the nation will nominate the next president of the United States in a city of working people, labor unions, and communities of color, all of whom play a critical role in who we are as Democrats. This is the first time the Democratic party has held a national convention in the Midwest, outside of Chicago, since 1916. This choice emphasizes the importance of the heartland and the strength of a diverse community working together. Last election cycle, Democrats saw some of their biggest gains in Milwaukee and all across Wisconsin. The city of Milwaukee and the state of Wisconsin represents a prouder, stronger, more successful Democratic Party and we could not be more excited to be in Milwaukee from July 13-16, 2020 for the Democratic National Convention. If you get inquires you can direct folks to our website here. I am reaching out again about Organizing Corps 2020 with an update and some next actions to recruit disabled students for this program before the application deadline on April 8, 2019. #OC2020 offers student organizers who will graduate from college by Spring 2020 the chance for a paid training and a job this summer in AZ, FL, GA NC, WI, MI and PA. Then after they graduate next year they can transition into a job on the eventual Democratic presidential nominee's campaign in June 2020. I wanted to make sure you’re up to date on where the program is going, programmatic next steps, and how you can help. So far, we have had about 30 disabled students apply for the program – will you help us reach our goal of getting 100 students with disabilities to apply by spreading the word? We know that you all are some of the best people for sharing information on social media and through the many disability community networks. The DNC and Organizing Corps 2020 teams are working tirelessly to ensure that the training program and job placement experiences are accessible and inclusive for all. We are also aware that timelines for graduation may be extended for students with disabilities due to scheduling accommodations. If students will be available to train and work this summer, then work June through November 2019 then they should apply regardless of graduation date. Below you’ll find top-lines about the program, ways you can help, and point of contacts moving forward. Please feel free to forward this email and share the opportunity with your networks! Build a talent pipeline that reflects the extraordinary diversity of this country and who will become future Democratic leaders who will work in the communities they know and love. We are currently recruiting juniors and paying them this summer to gain in-the-field organizing experience. Starting in the summer of 2020, we will work with new graduates and career changers to make sure their talent makes an impact in the field during the general election. Organizing Corps 2020 will start by focusing on seven states: Arizona, Florida, Georgia, Michigan, North Carolina, Pennsylvania, and Wisconsin. ● CORE PROGRAM: The DNC and seven state Democratic parties, in partnership with 270 Strategies and The Collective PAC, have launched Organizing Corps 2020 — a new program, starting in 2019, focused on recruiting, paying, and training young people, especially people of color, to work on the 2020 presidential cycle! ● APPLICATIONS: We are accepting applications on a rolling basis through April 8, with a priority deadline on March 18. Students can apply at www.organizingcorps2020.com. ● KEY DATES: June 10-August 2, and the program includes a five-day national training kick-off followed by Corps members working with their local Democratic party to turn their training into on-the-ground learning through voter engagement. ● PAY: Corps members can earn $4,000 while gaining valuable career skills in leadership, project management, and communication. ● GOALS: Train 1,000 Corps members over the next year to join the team of the eventual Democratic presidential nominee and help elect Democrats up and down the ticket in 2020. Our first wave of the program targets college juniors this summer. We plan on running the second wave of this program for non-college students next year. times aren't we...I believe unlike any other in our lives. the WLF and the crucial work of the DNC in these challenging times. for our presidential nominee in 2020.
join the Women's Leadership Forum in this fight at any level you can. National Issues Conference in Washington in the fall. I am counting on you. Please email me with any questions you may have. Thank you to all those who attended the Disability Council and Seniors Council joint meeting on February 14, 2019 at the 2019 Winter DNC Meeting in Washington, D.C. If you were unable to attend here is a transcript of the live captions. This was a one-time opportunity to collaborate with the Seniors Council and hear from speakers who are working on the front lines on issues affecting both communities. We heard from disability and senior advocates seeking to increase voter turnout and protect social security and medicare. DNC Chair Tom Perez and DNC CEO Seema Nanda also stopped by talk about the DNC's commitment to hosting an accessible DNC Convention in 2020. During the DNC Meeting's General Session on Friday Stacey Abrams spoke to attendees. She highlighted the fight against voter suppression in all forms including people with disabilities, and spoke out against the attempted misuse of the Americans with Disabilities Act during the midterm election In Georgia. Abrams also spoke about her commitment to community integration and disability equality by expressing her support for the Disability Integration Act. 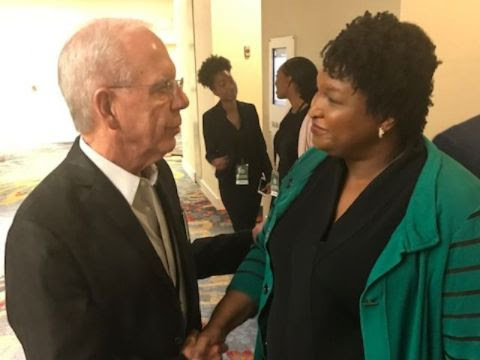 DNC Disability Council Chair Tony Coelho and Minority Leader Stacey Abrams. We hope that you can join us for the next Disability Council in-person meeting at the 2019 Summer DNC Meeting in San Francisco on August 22-24, 2019. I have forwarded below the wrap up email from DNC Secretary Jason Rae complete with some of the materials from the meeting including our political presentation. Thank you for your advocacy and participation in the Disability Council! I enjoyed seeing so many of you and having the chance to catch up this past weekend in Washington, D.C. at the DNC’s winter meeting. I left feeling energized about the work that we have done as a party the last two years under Chair Perez’s leadership to organize, mobilize and win. I’m even more inspired now for the work that it coming before us in 2019 and 2020. We had two general sessions during this meeting. We started with a fabulous general session on Friday, where we were joined by the amazing Stacey Abrams. Stacey shared important insights about her own race in 2018 and the future of our party. During Saturday’s general session, we heard welcome remarks from the Mayor of Washington, D.C. Muriel Bowser, who talked about the importance of statehood for the District of Columbia and its residents. We also heard from Manny Guzman, an organizer with the Pennsylvania Democratic Party, about how the DNC’s investments in state parties helped them to organize diverse communities. We also heard from the Reverend Al Sharpton, who left us feeling inspired. We also had a fabulous panel discussion with leaders from state parties, including Washington State Chair Tina Podlodowski, Florida Executive Director Juan Penalosa, and New Jersey Executive Director Liz Gilbert. These individuals spoke about the unique ways that they have been organizing in their state, how they have engaged grassroots groups, and what they are planning for 2019 and beyond. In addition to hearing from these speakers, we watched several inspiring videos created by the DNC. Those videos included: We Are Democrats, Defining Amendment XV and Honoring Juneteenth: Our Power In Time. Throughout the DNC meeting, each of our regional caucuses, as well as our constituency caucuses and councils, held meetings to discuss the core buckets from 2018, and 2019/2020 DNC priorities. Our political & organizing department also presented on all those things and their presentation can be found here. An accessible version of this presentation can be found here. Each session talked about the importance of the delegate selection process and how to be engaged in that process, from working to appoint members to their state’s Affirmative Action Committee, to reviewing the plans, and finally educating people in their area about how to run for delegate positions. Several elections took place to fill vacancies in specific caucuses and councils. In the Eastern Region, Yvette Lewis from Maryland was elected to a vacant Executive Committee representative position. In the Midwest Regional Caucus, Mark Mallory and David Walters were elected to two vacant Executive Committee representative positions. In addition, I want to recognize DNC Black Caucus Chair Virgie Rollins for the amazing Black History Month breakfast she organized for Saturday morning. The speaker, Dr. Frederick Haynes III, was remarkable. I left inspired and called to action. Those are a few quick highlights from our meetings in Washington, D.C. I am truly looking forward to working with each and every one of you in the weeks, months, and years ahead. Have a wonderful week, and I look forward to speaking with you soon. If you have any questions or concerns, please do not hesitate to reach out to me or my office. I flew into Washington D.C. a day early so I could attend the "I Will Vote" Gala to support our voter registration and turnout operation in all 50 states. It was great to reconnect in person with DNC staff, DNC Members, and other activists and friends on how we can best work together to move our Party and advance our issues forward. Speakers included DNC Chair Tom Perez, DNC CEO Seema Nanda, Speaker Nancy Pelosi, Senator Chris Van Hollen, and Congresswoman Deb Haaland. You can watch Speaker Pelosi's excellent introduction video by clicking here. On Thursday, the DNC's 2019 Winter Meeting began with Council meetings. I led my first full meeting as Chair of the DNC Youth Council; my Chair's Report centered around a plea to support and defend sexual assault and harassment survivors, as well as whistleblowers. Our Vice Chair Kat Hoang (Texas), DNC officers (including Tom Perez, Jason Rae, and Jaime Harrison), DNC staff, High School Democrats of America, College Democrats of America, and the Young Democrats of America all shared important updates and items for discussion. We also held an engaging Q&A segment and shared best practices. In closing the meeting, I recognized outgoing YDA President Louis Elrod for his service to our Democratic Party, our values, and all young people in this country. We adjourned the meeting in memory of Congressman John Dingell, Jr. and those who lost their lives in Parkland (which had occurred exactly one year ago). Immediately after the Youth Council, I attended the meeting of the DNC Credentials Committee. I am the only Californian on the committee, which began at 10:30am and didn't conclude until after 3pm. We heard two combined challenges against the DNC credentials of the Chair and Vice Chair of the Alabama Democratic Party, alleging that the meeting that resulted in their election was improper. After discussion, I believed that (1) the Alabama Democratic Party structure essentially barred any minority groups (other than African-Americans) from participating; (2) there was no effective notice; and (3) that proper election procedures were not followed. Therefore, I argued that the election results should be thrown out and the credentials for the Alabama Chair and Vice Chair should be revoked, and a new election called. The committee voted unanimously to call for a rewrite of the Alabama Democratic Party's bylaws (which must be approved by the DNC Rules and Bylaws Committee), followed by new elections supervised by the DNC. However, I was disappointed that the committee voted 12-11 to allow the Alabama Chair and Vice Chair to keep their DNC credentials; as I stated during the committee meeting, I felt that allowing them to keep their DNC credentials would not disenfranchize Alabama Democrats (since Alabama has other DNC Members), but rather it would further compound the problem created by the improper election. You can watch the Alabama Chair defending herself, and U.S. Senator Doug Jones (D-AL) speaking in favor of the challenging parties, followed by Q&A and discussion by the committee members by clicking on this link. Senator Jones begins his testimony at 5:52 in the video; I ask questions and speak from 20:00-30:40, 1:02:25-1:04:40, and 1:22:30-1:23:33. You can read the final report of the Credentials Committee by clicking here. The day began with an early 7am breakfast for Caucus and Council Chairs. We discussed past successes and challenges, especially as they relate to our Caucuses and Councils, and we planned for the future and organizing around races in 2019 and 2020. Discussion on goals, engagement, support, and training was led by DNC staff. For pictures of the provided handouts, please click here. Chairman Tom Perez was in attendance and provided some brief closing remarks, and he mentioned the success we had in the midterms in California and Orange County. I then attended an extensive anti-sexual harassment training with other DNC Members and campaign staff. For photos of the slideshow, please click here. After a brief DNC Members-only session, we heard from former Georgia gubernatorial candidate Stacey Abrams. To watch some of her speech, please click here. We also saw this short but impactful video entitled "Our Power in Time." It's definitely worth a watch -- no pun intended! Saturday began with an energizing Black History Month Breakfast hosted by the DNC Black Caucus. I livestreamed one of the keynote speakers, Wisconsin's Khary Penebaker, who also serves as the Treasurer of the DNC Black Caucus; you can watch his speech by clicking here. Following the breakfast, I attended the Western Regional Caucus. The meeting was led by Washington State Chair Tina Podlodowski. Laurence Zakson reminisced about one of our own, Greg Pettis, and Luis Heredia (Arizona) spoke about Carolyn Warner, both of whom recently passed away. We received updates from DNC staff (on our electoral successes in 2018, infrastructure investments, and tech updates) and from our Caucus Officers and Executive Committee representatives. We also heard reports from the states. Sandra Lowe provided the California Democratic Party report, focusing on our successful campaign to elect Tony Thurmond for State Superintendent of Public Instruction. Highlights from other states include a $17 minimum wage bill in Hawaii, killing a Republican-led gerrymandering effort in Idaho, John Tester's win in Montana and Jacky Rosen's win in Nevada, a tripling of the size of the Washington State African-American Legislative Caucus, and celebrating that votes from Democrats Abroad provided the margin of victory that flipped two Western Region congressional seats: CA-21 and UT-04. During General Session, we approved the Credentials Committee and Resolutions Committee reports. The final Resolutions Committee report, which amended this document here, removed Resolution #21 (Creating a DNC Task Force to study the role of corporate money in fundraising) and replaced it with a vote by the 2020 Democratic National Convention Platform Committee on whether these corporate contributions to the DNC would be allowed in 2020. While we didn't get everything we wanted, I do want to thank California DNC Member Christine Pelosi for her leadership on both her original resolution (which I co-sponsored, but did not pass out of committee) and this compromise referral to the 2020 Platform Committee. The primary guest speaker at the General Session was the Rev. Al Sharpton; you can watch some of his speech here. As always, if you have any questions about this meeting or anything else related to the DNC, please feel free to reach out to me by email, Facebook, Twitter, or text/call me at (510) 717-8260. Thank you for the opportunity to serve you and our National Party. Yesterday Stacey Abrams visited the DNC Meeting in Washington, D.C. We had the chance to speak about her commitment to our community and I thanked her for her disability focused video response to the State of the Union. When she took to the stage Stacey made disability a centerpiece of her speech. She recognized how disabled advocates organized with her campaign to fight voter suppression in Georgia during the 2018 election cycle. She also drew attention to the story of Lois Curtis and the U. S. Supreme Court's Olmstead Decision, lifting up the cause of community integration. Stacey Abrams let us know that she has joined our disability inclusion revolution, and she set an example of allyship for the Democratic Party. It was great seeing DNC Members in DC this past week! I was grateful to catch up with many of you and hear about the great work you’ve been doing. I left feeling inspired and excited to continue working together. In January, Democrats took back the House and swore in the most diverse Congress yet -- with a record-breaking number of women and with groups like Native American women seeing real representation in Congress for the first time. Now that we have control of the House, Democrats' top priority will be reforming the system so more diverse voices can be heard. In our first bill, H.R.1, we are taking real steps to pass automatic voter registration, end partisan gerrymandering, and restore the Voting Rights Act. And I'm personally working to take this further with my 21st Century Voting Act that, among other much-needed reforms, will make Election Day a national holiday and lower the voting age to 16. With these crucial steps, we can make our election process and our democracy more accessible for all. Last year, I made it my top priority to empower the next generation of Democrats -- young voters and college-age voters. I invested $80,000 through the New York State Party to fund full-time campus organizers in the 5 top House districts in New York. Through this program, we registered almost 3,000 new voters in the state’s most competitive districts, which resulted in flipping three House seats and winning a Democratic majority in the state Senate. These young voters are the future of our party and our country, and I look forward to continuing to make investments like these in 2019. In 2018, the blue wave didn't just happen in Congress. Democrats worked with state parties and candidates to help flip not only Congress but state legislatures and to elect Democrats across America. For my part, I traveled to 14 states -- including Arkansas, Arizona, Connecticut, Georgia, Iowa, Michigan, Nevada, New Hampshire, New Jersey, Ohio, Pennsylvania, Texas, Utah, and Virginia - to support state parties, candidates, and activists throughout the country. I saw many of you as I traveled the country last cycle, partnering with our state parties to elect Democrats up and down the ballot and get out the vote. Now, I’m looking ahead towards 2020. I'm excited to expand on the organizing and outreach work I did last cycle, and I'm committed to continue partnering with you. I’ll continue to support outreach to underrepresented communities - from mobilizing Asian American and Pacific Islander voters, to making sure rural communities know that we at DNC are listening. I’ll continue to support and invest in women candidates and our women’s caucuses across the country. And I plan to further invest in the incredible organizing work being done by the College Democrats, High School Democrats of America, and Young Democrats of America. Please keep in touch on how I can work with you on these or any other efforts! Congresswoman Grace Meng is a Member of the U.S. House of Representatives, DNC Vice Chair, and Assistant Whip for House Democrats. Its Official!! DNC Launches New Program: Organizing Corps 2020! Today, the Democratic National Committee and state Democratic parties in Arizona, Florida, Georgia, Michigan, North Carolina, Pennsylvania and Wisconsin, in partnership with 270 Strategies and The Collective, announced the launch of Organizing Corps 2020, a program to recruit and train students expecting to graduate by June 2020 and place them as field organizers in key states. Organizing Corps 2020 will help build the grassroots infrastructure needed to defeat Donald Trump, while investing in the next generation of Democratic leaders — focusing on students from communities of color who have been traditionally underrepresented among political campaign staff. With a structured school-to-career pipeline for organizing, Organizing Corps 2020 will recruit juniors in the spring of 2019 from local colleges, including HBCUs, and non traditional schools, in a number of states where Democrats fell short in 2016 and need to be competitive in the 2020 general election. These students will work on state party priorities in an eight-week, on-the-ground training program with campaign veterans, who will teach them critical organizing and campaign skills such as voter registration, data analysis, and digital organizing. After the training program, Corps members will return to their campuses and communities to put their organizing skills to work. By May 2020, nearly 1,000 Corps members will graduate ready to help elect the Democratic nominee and Democrats up and down the ticket in several key 2020 states. "It's critical that young people of color are engaged as not only a core Democratic voting bloc but as pivotal organizers needed to mobilize their communities to the polls in 2020," said Stefanie Brown James, Co-Founder of The Collective and former National African American Vote Director for Barack Obama's 2012 re-election campaign. "Through a culturally rich curriculum and relevant training from respected community leaders, Organizing Corps 2020 will help propel the young people in the program to make a significant contribution to the Democrats' success in 2020 while preparing them to hold increasing positions of influence as campaign staffers and within the Democratic Party structure." ‘Organizing Corps 2020’ will be led by campaign veterans: Executive Director Rachel Haltom-Irwin, Chief Program Officer Jonae Wartel, Chief Operating Officer Naoko Kudo, and Senior Development Advisor Yolanda Magallanes. The Organizing Corps 2020 program is only one piece of DNC’s battleground plan, but a key part of the infrastructure the DNC and state parties have been developing to support the presidential nominee and Democratic campaigns all across the country. The program builds on state party organizing and DNC investments in all 50 states that led to historic Democratic victories in the midterm elections. Just last week, the DNC announced a data and tech overhaul that will help Democrats reach and communicate better with voters all across this country. Rachel Haltom-Irwin, Executive Director. Rachel got her start in 2002 organizing on a state Senate race in Massachusetts. She has worked on issue and electoral campaigns as well as spending five years working in K-12 education. She was GOTV Director for Jon Tester in 2006, the Iowa Youth Vote Director in 2007-08 for Senator Obama, the General Election Director in Indiana in 2008, the White House Internship Director in 2009, and the National GOTV Director in 2012 for President Obama. Jonae Wartel, Chief Program Officer. Jonae began her career as an organizer on Barack Obama’s 2008 & 2012 campaigns. One of her earliest national roles was as the training director and then executive director of the Association of State Democratic Chairs where she lead party-building efforts for the Democratic National Committee; engaging all 57 state parties. In her role as training director; she developed and led the Democratic National Committee’s first ever national training program for state parties. Most recently she served as Southern Regional Director for the Democratic National committee, developing regional strategy and managing electoral investments in 13 states. Originally from Marietta, GA; she has had the great fortune of living and working all over the country. Naoko Kudo, Chief Operating Officer. Naoko started her career in the private sector as a financial planning analyst with Gap Inc. before leaving to join Senator Obama’s campaign, serving as a field organizer at Temple University and in North Philadelphia’s 20th Ward. Naoko has spent the last 10 years working in the education and non-profit sectors serving as a school leader, operations leader and most recently, as a founding team member at The Primary School, a new program model in East Palo Alto, CA that weaves together education, health and family supports . Yoli Magallanes, Senior Development Advisor. With over a decade in fundraising experience, Yoli has worked with advocacy groups and political candidates to raise the resources needed to run effective campaigns, both at the major donor and grassroots level. Yoli has worked for Organizing for Action, the 2012 Presidential Inaugural Committee, Obama for America, and launched her career with The Ashmead Group directly supporting Governor Ted Strickland, Senator Mark Udall and Congresswoman Doris Matsui. Corps members can earn $4,000 gaining valuable career skills in leadership, project management and communication while experiencing the exciting and rewarding field of campaign work. The program kicks off with a five-day national training led by campaign veterans, where corps members will learn key skills in field and digital organizing, and data analytics. For the remaining 7 weeks, corps members will, with the help of a coach, return to their home communities and work with their local Democratic Party to turn their training into on-the-ground learning through action – organizing neighborhoods and registering voters. In the process, corps members will build a powerful network of like-minded peers and mentors from across the country that will last beyond 2020. The summer 2019 corps experience will give young people the skills and tools to organize their community and – importantly – get a great first job fighting to win across the country in 2020. Organizing Corps 2020 will recruit students from seven states that are crucial in providing a pathway to 270 with four key characteristics -- these are states that are not a focus in the primary season; have had close margins in the past; will benefit from skilled field staffing; and have an expanding electorate. We are excited to share with you the DNC’s framework for several key elements of the 2020 Democratic presidential primary debates. This is the first announcement of our process and we are grateful to so many of you for sharing your valuable feedback with us. Please let us know if you have any questions or concerns, and know that we will be in touch with more information in the new year. Washington, D.C. -- Since his campaign for chair of the Democratic National Committee, DNC Chair Tom Perez has promised to conduct a presidential primary process that is transparent, fair, inclusive, and puts the party in the best possible position to take back the White House in 2020. Perez has followed through on this promise by passing historic reforms that have expanded the use of primaries, made caucuses more accessible, reduced the influence of superdelegates, and increased transparency of the DNC’s budget and operations. He is continuing this effort with his approach to the presidential primary debates. Perez and his team have held more than 80 meetings over the course of many months with a variety of individuals who have knowledge of and experience with the debate process. Today, Chair Perez is pleased to announce the DNC’s framework for several key elements of the 2020 Democratic presidential primary debate process. “To win back the presidency in 2020, Democrats must lead with our values. That began with the historic reforms to expand and increase trust in our party, and it will continue by conducting party business fairly, transparently, and inclusively throughout the 2020 primary process,” said Chair Perez. “To that end, we have listened and learned about debate experiences from a wide array of stakeholders. The DNC is announcing 12 presidential primary debates over the course of the 2020 cycle, with six debates in 2019 and six in 2020. The first two debates will occur in June and July 2019. After a break in August, there will be one debate per month for the rest of 2019. The DNC currently plans to hold its last debate in April of 2020. All early-state debates will be held in 2020. The DNC will not bar candidates from participating in forums in which one candidate appears on stage at a time. The DNC will ask candidates to refrain from participating in debates other than the 12 debates sanctioned by the DNC. In order to give our candidates a platform to make their case to voters, the DNC will seek to maximize the viewership of each debate. The DNC will announce specific dates, locations, sponsors and more in 2019. Given the fluid nature of the presidential nominating process, the DNC will continuously assess the state of the race and make adjustments to this process as appropriate, and always transparently. The first two debates will occur in June and July 2019. In order to accommodate a potentially large field of candidates, both may occur over multiple consecutive nights. In addition to meeting the filing and constitutional requirements to run for President of the United States, candidates will qualify for the first two debates by meeting criteria that include both polling and other objective measures that reflect a candidate’s support, such as grassroots fundraising. The specific criteria for the first two debates will be announced in January 2019. With 19 days to go, below are some DNC updates that we are pushing out to our networks and would love your help amplifying! Final Push for Team Blue: In coordination with Swing Left, 270 Strategies, and other key partners, we have deployed dozens of people to campaigns around the country and sent thousands to fill GOTV shifts and other critical GOTV roles. We are doing another push to help people head to critical campaigns - below is language you can use to encourage anyone who wants to help this cycle! With less than three weeks before the most important Election Day of our lifetime, campaigns around the country still need our help. Most of these elections are going to be won or lost by hundreds of votes. Here are ways that you and your network can plug in. It’s not too late! Some draft tweets to re-tweet or to re-make your own! IWillVote.com Updates: We have made some exciting updates to IWillVote.com! Embeddable polling place widget: We have updated our polling place locator tool that campaigns, state parties, and organizations can now also embed on their own websites! Not all polling information is released by states at the same time though, so we add locations to IWillVote.com as soon as they become available. End-to-end Spanish translation: Our Iwillvote.com site is now translated in Spanish! Head to VoyaVotar.com. A daily updated list of what early vote and polling places are up: IwillVote.com! We hope it’s a helpful resource for voters and for our partners! We would love your help pushing out these options and resources to appropriate people. I hope you all had a great week. It was great to see many of you at our 2018 Summer Meeting in Chicago. It was an extremely busy meeting, with lots of thoughtful discussion about the direction of our party. Adoption of the 2020 Delegate Selection Rules and Call to the Convention – During our general session on Saturday, we voted by acclamation to adopt the Delegate Selection Rules and the Call to the Convention as was presented by the Co-Chairs of the Rules & Bylaws Committee, Jim Roosevelt and Lorraine Miller. You can find a complete and final copy of Rules here and the Call here. Approval of Amendments to the DNC Charter and Bylaws – During the general session, the membership also unanimously adopted two amendments to the DNC’s Charter & Bylaws. The first amendment incorporated transparency-related party reforms from the Unity Reform Commission’s Report. The second amendment updated equal division language to make it consistent with the 2020 Delegate Selection Rules and 2020 Call for the Convention, and to allow for inclusion of gender non-binary members and delegates. You can find an updated copy of the DNC Charter & Bylaws here. Adoption of the Report from the DNC Credentials Committee – The full DNC also approved the report, presented by Credentials Committee Co-Chairs Karen Carter Peterson and John Currie. You can see their report here. Adoption of the Report from the DNC Resolutions Committee – On behalf of himself and Co-Chair Lottie Shackelford, Co-Chair Stuart Appelbaum presented the report of the DNC Resolutions Committee. The report included the approval of 33 resolutions – a mix of policy and commemorative. He also shared that the Executive Committee adopted four commemorative resolutions at its meeting on Thursday morning. In addition, we heard reports from a number of DNC Officers and Staff on the work that we are doing to build towards victory on November 6. During the meeting we shared a copy of the DNC Member Toolkit, which you can access here. This is an important document for all members and highlights many of the recent successes of the new DNC and also shares the number of ways you can be engaged in the work. Please take a moment to read the document and let us know which ways you will be engaged. Thank you all for your work and dedication to our party. As a reminder, the full DNC will not meet again in-person until after the Election in November. Until then, we all need to be hard at work helping elect Democrats from the school board to the Senate. If you have any questions or need anything else, please do not hesitate to let me or my office know. Thanks again.